← Day Time Speed Scrap on Thursday! 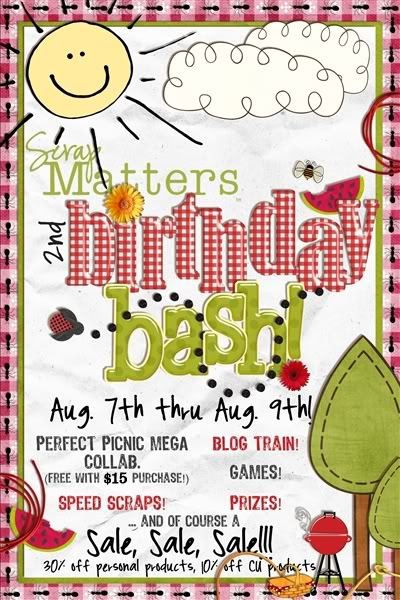 ScrapMatters’ 2nd Birthday Bash is Coming Soon! Holy moly! Can SM really be turning two? Time has flown by these past two years. I literally can not believe how much SM has grown–from a little idea in my head to this: a fun site with an active, wonderful community. A gallery filled with unlimited inspiration. Thanks to all of you who have helped ScrapMatters become what it is today. We have a fabulous collab called “A Perfect Picnic” that is free with a $15 purchase. There will be a blog train starting here at my blog–with three different kinds of goodies. There are quite a few fun games and speed scraps galore. This entry was posted in about me, freebies, ScrapMatters, speed scrap. Bookmark the permalink.